The State Board of Education will hold its monthly meeting on Thursday, January 17, 2019 at 5:00pm at Seaford Central Elementary School (1 Delaware Place, Seaford, Delaware). In compliance with the State's Administrative Procedures Act (APA - Title 29, Chapter 101 of the Delaware Code), 42 CFR §447.205, and under the authority of Title 31 of the Delaware Code, Chapter 5, Section 512, Delaware Health and Social Services (DHSS) / Division of Medicaid and Medical Assistance (DMMA) is proposing to amend the Delaware Social Services Manual (DSSM) regarding Eligibility Determination, specifically, to align state and federal policy. Any person who wishes to make written suggestions, compilations of data, testimony, briefs or other written materials concerning the proposed new regulations must submit same to, Planning, Policy and Quality Unit, Division of Medicaid and Medical Assistance, 1901 North DuPont Highway, P.O. Box 906, New Castle, Delaware 19720-0906, by email to Nicole.M.Cunningham@state.de.us, or by fax to 302-255-4413 by 4:30 p.m. on January 31, 2019. Please identify in the subject line: Eligibility Determination. The Department proposes to adjust the start time for the opening day of freshwater trout season on designated trout streams. Opening day of the freshwater trout season is an event that draws large crowds of anglers to New Castle County's designated trout streams. Opening day of trout seasons often have a specified start time to help manage angler competition for fishing locations, but the current 7:30 a.m. opening day start time serves no current resource management purpose, is not meaningful for managing angler competition for fishing locations and unnecessarily limits angler access and participation. At the suggestion of a member of the public, Delaware's Advisory Council on Wildlife and Freshwater Fish recommended that the start time of Delaware's opening freshwater trout season be changed from 7:30 a.m. to 7 a.m., which is consistent with the 7:00 a.m. opening day start time established for designated trout ponds in Kent and Sussex Counties and provides expanded angler opportunity and participation. Angling hours for the remainder of the trout season (one-half hour before sunrise to one-half hour after sunset) are not affected by this action. The Department also proposes two technical corrections to the Non-Tidal Finfish regulations. The Department proposes to clarify the definition for that portion of Pike Creek that is designated as a trout stream to reflect contemporary landmark and roadway naming. The Department also proposes to clarify that the upper bound of the smallmouth bass protected slot limit includes those fish measuring 17 inches in total length. 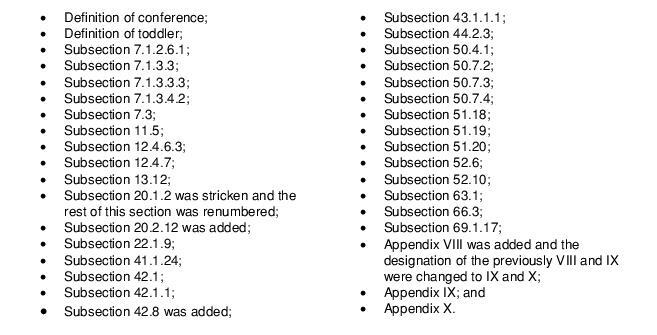 The hearing record on the proposed changes to 7 DE Admin. Code 3300 Non-Tidal Finfish - 3301 Definitions and 3304 Creel Limits, Size Limits and Seasons opens January 1, 2019. Individuals may submit written comments regarding the proposed changes via e-mail to Bethany.Fiske@state.de.us or via the USPS to Bethany Fiske, Hearing Officer, DNREC, 89 Kings Highway, Dover, DE 19901. A public hearing on the proposed amendment will be held on Wednesday, January 23, 2019 beginning at 6:00 PM in the DNREC Auditorium, located at the Richardson & Robbins Building, 89 Kings Highway, Dover, DE 19901. Public comments will be received until close of business Thursday, February 7, 2019. These amendments would require centers to be free of lead-paint and radon hazards and the additional requirement for centers located in a building/structure that contains or contained a business that may result in unacceptable air quality to have the air quality tested protects children's health. Comprehensive background checks and suspension and expulsion policies are required to comply with the Child Development Block Grant Act of 2014. 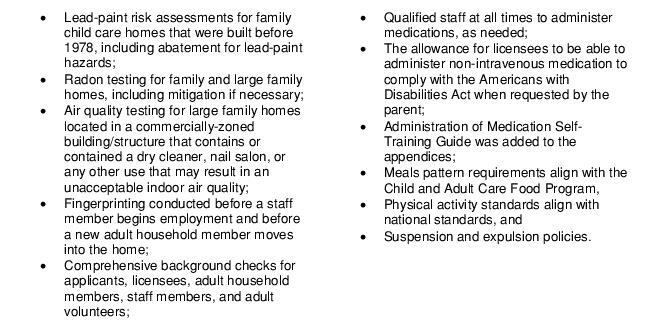 Lastly, by amending these regulations, the needs of children requiring medication (with parent/guardian permission) while in child care will be met, consistent with the principles of the Americans with Disabilities Act. In addition, the application forms, the specific requirements to obtain a license, and due process provisions have been added to the regulation. Interested parties wishing to offer comments, suggestions, data, briefs, or other materials concerning the proposed regulation may submit them to the Office of Child Care Licensing, Division of Family Services, Department of Services for Children, Youth and Their Families, 3411 Silverside Road, Hagley Building, Wilmington, Delaware, 19810, Attention: Kelly McDowell or email them to Kelly McDowell at Kelly.McDowell@state.de.us by the close of business on January 31, 2019. These amendments would require family and large family homes to be free of lead-paint and radon hazards, and the additional requirement for large family homes located in commercially located buildings that contain or contained a business that may result in unacceptable air quality to have the air quality tested protects children's health. 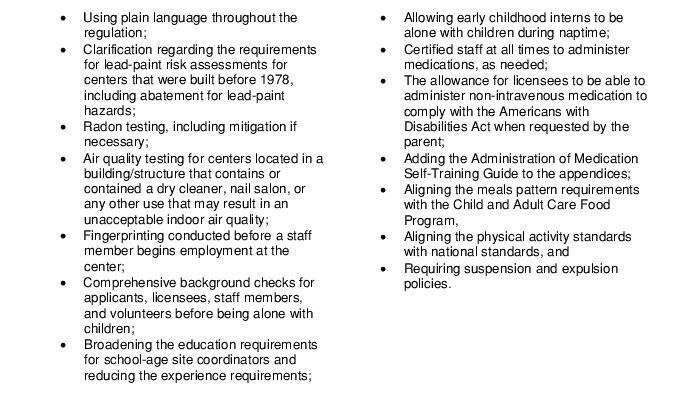 Lastly, by amending these regulations, the needs of children requiring medication (with parent/guardian permission) while in child care will be met, consistent with the principles of the Americans with Disabilities Act. In addition, the application forms, the specific requirements to obtain a license, and due process provisions have been added to the regulation. Pursuant to the authority provided by 29 Del.C. §8404(8), the Delaware Department of Transportation (DelDOT), adopted 2306 Policy and Procedures for Crash Data Release. The Department, through its Division of Planning and Policy (“DelDOT”), seeks to repeal 2 DE Admin. Code 2306. The regulation covers the release of crash data by the Department of Transportation to any entities or personnel outside of DelDOT. The Delaware Department of Safety and Homeland Security (“DSHS”) are the owners of all crash data received by DelDOT. Based on current operating procedures between the two agencies, this regulation is no longer necessary and can be repealed.